In the last blog I talked about musical figures such as motifs, melodies, rhythm patterns, figurations, harmonic sequences, etc. Being actors in musical stories they can be positioned and repositioned differently in the musical space and time, they can move away from each other, approach and overlap. Some of them can act sharp in the foreground, the others get blurred in the background; they can be painted in different colors, appear deformed, distorted and almost unrecognizable. 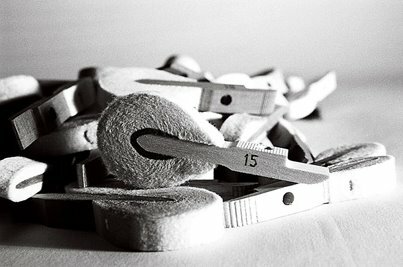 Generalizing, we can say there is a whole range of composing techniques, in which not the object itself but our view on it is changed. In other art forms like painting, sculpture or literature these techniques are called perspective. These striking parallels between music and other arts in regard of positioning the represented objects make also remember that the activity itself of “composing” is an allusion to the Latin “componere” meaning “put together”. Not surprisingly, the word “perspective” proves to be very helpful when talking about music and it allows us a deeper understanding of the “composer’s kitchen”. For those of you who are on friendly terms with math, you may know there are two main ways of looking at a composition: the describing the functions of the components or visually representing the objects from different sides. The first type is practiced in algebra, the second in geometry. Before it gets too complicated, let us turn back to arts where these two kinds of approach correspond to system or accordingly to perspective analysis. The last is called narratology in literature. There seems to be no suitable word in the musicology till now, so I will just use the most compatible word “perspective”. A complete systematic description of the perspective situations available to a composer would be ripe for a dissertation, so I will sketch the most important ones. Narrative mode – there is a big choice starting with a solo up to a large symphony orchestra with choir. All intermediate forms like a duo, trio, quartet, quintet, etc. are possible. Also mixed forms with a constantly changing narrator are possible, for example a concerto, where a soloist is competing with an orchestra. If there are more soloists it is called concerto grosso. Let us take a look at the literature. We can have a subjective or omniscient view comparable with solo vs. any kind of ensemble, alternating narrators are also possible. In painting the first-person perspective outweighs but also multiple perspectives are possible, they could be positioned beside each other in streaks or concentric circles like in some icons, or overlap as for example in some pictures of Piccasso. Vertical – the register of a musical figure: central, high, low, or mixed. We know it from the music theory as transposition. A special case is also known as the polyphonic technique of inversion, in which the original melodic structure is vertically inverted so that the highest tones become the lowest and vice versa. The initial high strings of Wagner’s opera “Lohengrin” is a good example of the so-called bird’s eye view when the action is viewed from “above”. In contrast, the beginning of the second movement of the 2nd Sonata (B-minor) by Chopin, the funeral march, gives us a good look at the main motif “from below”, so to say, seen from the Inferno. You can imagine that the possibilities are inexhaustible. Horizontal – a musical figure has its tonal and rhythmic sides, which I would like to compare with the frontal and side views. If both tonal and rhythmical axes are elaborated and complex, we can speak of a central perspective. Sometimes composers vary a motif taking just its melodic or rhythmic part. In these cases we would speak about frontal or side view. A good example would be the first movement of the fifth symphony of Beethoven, where the famous “fate motif” varies in the development falling apart alternatively to a sequence of pitches or to a rhythm figure. In general, more complex rhythms define more spatial depth of a musical figure showing it with more details. Distance – it plays a very big role in the music and is usually defined by the volume. Put simply: louder=near vs. softer=farther. More playing instruments also signifies more details, which suites perfectly the concept of distance, especially when we deal with thirds, sixths, or more complex harmonic doublings. In “Bolero” by Ravel we can virtually feel the music approaching. The ever-increasing volume and the growing number of instruments and doublings evoke the distance change from “far” to “right in the middle “. Focus – from a clear melody to a “blurred” figuration anything is possible in the presentation of musical figures. The sharpness of the foreground is often emphasized by special accents and staccato articulation. Short tones with distinctive rhythms suggest an almost photographically working sharpness, whereas smooth legato arpeggio figurations give the impression of vagueness out of focus. Some Preludes of Debussy, like “Ce qu’a vu le vent d’ouest” (What the West Wind Saw), for example, are full of “blurred” figurations that are supposed to picture the contourless wind; otherwise, his “Claire de la lune” has a clear distinctive melody surrounded by indistinct figurations. Color – additionally to the number of instruments in a composition, their choice is also important: a duo of two violins presents a totally different perspective compared to, let us say, a violin and a trumpet. Depending on the composition, it can also have a special meaning in the musical story. From optics we know the effect of the warmer (reddish) colors of the objects giving the impression of being nearer and of the colder (bluish) colors as being farther. This effect is also known in music where string instruments, with richer overtones, sound “warm”, “intimate” and “close” whereas woodwinds seem normally to sound more distant, especially when played without the “warming up” vibrato. The normal positioning of the orchestra instruments on the stage amplifies this effect, as the wind instrument players sit behind the strings. Time – as also the musical space, it allows many modifications of the perspective: it can be stretched and compressed, accelerated and slowed down. Apart from changes of the main tempo, individual figures can be varied rhythmically and run, for example, in half or double rhythmic values. Of course, it is just the simplest possibility. In extreme cases, such as the renaissance motet, Gregorian chants were stretched so far that its single notes became extremely long bass tones and served as the base for whole episodes. Such tones were eventually stretched to several minutes! Style – a relatively new type of perspective change is the stylistic axis: traditional versus modern, which means that one and the same figure can be for “disguised”, for example, in Baroque, Classical or Romantic. Already in the renaissance parody mass quotations from other styles were a commonplace. Often they changed the view on the underlying cantus firmus representing it from different perspectives. One of the most famous examples of this technique is very common in Schubert’s music. 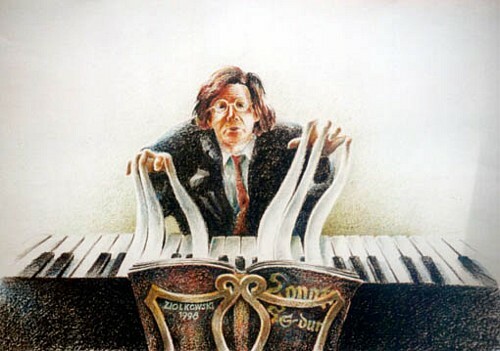 The composer “dresses up” his tunes alternatively in major or minor keys. In the western classical tradition major is considered to be “clearer” and “more stable”, in other words it was regarded as the genuine “original”. Minor, however, emerged as a deviation, symbolizing “pathological” phenomena such as sadness – the greatest sin in Christianity. In Schubert’s music this meaning is getting lost but the time perspective remains. In the music of the last decades the third movement of Berio’s “Sinfonia” would be an excellent example of the stylistic dressing up. Here the original music from the second symphony Mahler is overlied by diverse quotations and stylistic imitations. At some points we are able to recognize the music of Mahler but some of them sound like a strange disguise of the original quotation. All these perspective settings do not stay the same during a composition and the changes from a setting to setting allow many possibilities: from sliding or gradual panoramic change to clear cuts – everything is possible. The composer is free to form them and to make them interesting and diversified, so that it doesn’t get boring for the listener. The two extreme settings would be the so-called “”minimal music where the perspective is close to absolute static and the changes are extremely reduced. On the other hand we have the so called “new complexity” with rapid and continuous changes of perspective, so that the listener is no more capable of tracing them. A balanced out but rich on variations perspective is a premise for a successful communication with the listener whose capacity shouldn’t be underestimated but also not overused. The numerous masterpieces of music history are the best examples and a good point to start. I hope this short sketch of musical perspective will give some inspiration to an attentive listener and put even well-known compositions “into a new light”. Have fun exploring them! Can music tell a story? Like other art forms, music reflects the reality we live in, playing, enriching and sometimes even changing it. From the mere imitation up to the bold creation of new worlds, everything is within its power, all the ways stay open if you know how it works and of course if you have a plan, where to go. One of the most successful ways to exchange with the “outer world” is telling stories about it, stories that are able to throw a new light on it, to build up a tension between what we are used to and where we imagine we could go. In order to better understand this relation, it is important to clear up the distinction between the “what” and the “how” of the story that is told, pictured, danced, played or sung. When a story is being told, the chain of events can be presented in very different ways – a chronological order, with jumps in time forth and back, incomplete, with time gaps, or even backwards. One can go deeper or less into details about the hero or the scenery of the story. The choice of words and the rhythm of the narrative can change the original report enormously. All these means of “deformation” of the narrated events build the set of artistic means of expression. It is them which make it possible to transform a simple report to a poem, story, or a novel. The same is with painting. For example, when a bouquet of flowers is painted – the colors, the embedding into the space, the shadow tones, the clarity or blurredness of the contours give an artist a whole range of means into the hand, enabling him to change the original and to produce a personal vision of the object, which we call art. The author’s choice of expressive means, his preferred methods of transformation of the objects and the view on the object is usually referred to as technique. When art (actually, all of them, including literature and music) is reflecting, alienating and shaping our life reality, in this very moment of perception it causes something in us, it touches us and transports into us a unique content that is not capable to exist in a different form and thus is not translatable. Still, it exists, this content, it lives within us, we take it home, carry it everywhere with us, sometimes throughout our whole lives. The commonly held opinion is that music, in contrast to other arts, speaks “directly to the heart”, that music is capable to appeal to the emotions of the listener without any meditation. Of course, this does not mean that when “talking to the heart” music cannot use a highly sophisticated technique of “musical speech”, able to tell even complex stories and actually doing it constantly, not only in large forms such as symphonies or instrumental concertos but also in small piano pieces and even popular songs . The fact that you cannot clearly and unequivocally express in words the content of the music does not mean music is not telling anything. Like any other art, music also has its motives, themes and stories. Its nature is, however, a very special one because music has emerged as a companion of the natural speech and both of them originated in the world of sounds. 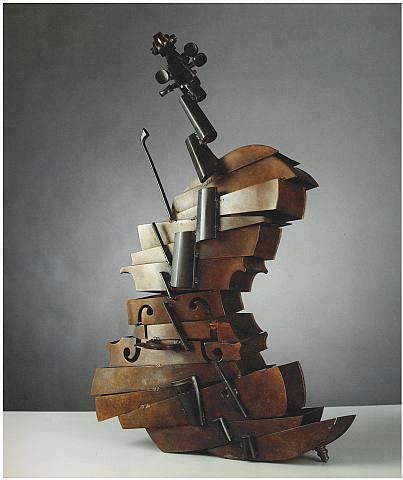 Music had to create its own domain, its own completely different set of expressive means in order to develop freely. What she created is very unique, and after all musical art can be called the most independent of all the arts. The origins of music lose their traces in the thicket of millennia, and as there are no more societies in which music is on its very first stage of development, we cannot have a 100% true notion of its way. 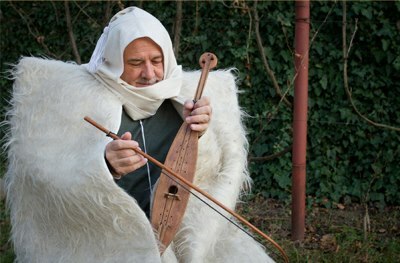 However, the multiple studies about the still existing pre-industrial societies seem to give strong indices that music was always connected to the spoken word. If visual arts such as painting, sculpture, and dance started with an imitation of optically perceptible objects and actions during a syncretic ritual performance, music seems to raise from the tradition of “special speech”, when louder and longer sounds emphasized and enhanced the linguistic expression. Also stones, shells and hollow bones were used for this purpose, always embedded in a ritual, the later giving sense and meaning to the action. Since time immemorial, the spoken word has been recited and sung, shouted and whispered. Over time some types of this “speech embellishment” have been used over and over again in the same situations, until finally the repetition made them so self-evident that they were able to carry their function without the spoken word. Generations were needed to form stable content references but eventually it worked so that we can speak of emerging of musical signs, vocal and instrumental, all capable to carry messages on their own. It wasn’t an intended development, just a beautiful side effect and the result of millions of taste choices made in the emerging small societies. Each of them took a slightly different way giving birth to the inexhaustible variety of styles. Becoming increasingly complex, one day sound patterns started to refer to themselves thus creating messages no more reducible to the spoken language. This is the birth of absolute music. The original reference to concrete objects, situations or events remains stamped in the structure of the musical signs. There is always a structural similarity between at least some part of a musical sign and its “original”. This type of a sign that reflects the designated in their very own form, we call them iconic signs. In this sense, music is a construction of iconic signs that are connected to a larger whole according to a set of special combination laws, their “grammar”, different in every musical culture. Under some circumstances, every element of musical structure can start transporting meaning, depending on the role, the author assigns to it in the story. Yet, also dealing with new, just created musical figures you can always be sure to find some structural similarity between the new musical sign and its reference! There is also a part of the musical grammar that doesn’t carry any meaning, created just out of necessity to organize complex musical signs into units easy to handle. It only obeys to the taste of the creators, to their understanding of beauty. We call it aesthetical part of the music. It is this part of music that will always elude being matched to a certain meaning, remaining a beautiful “end in itself”, serving for nothing else than an esthetical pleasure. Contrary to a natural language, music didn’t emerge purely for mutual understanding and a practical coordination of actions. It will always remain an enriching addition, an extra, not reducible to the language and yet not quite forgetting its meaningful origin. Being “abstracted” from the natural language, musical meaning units are denser and more intense than what they were originally supposed to refer. When we talk about music we would always stay vague in our verbal descriptions, reducing the description to more or less abstract notions of “active” or “quite”, “light” or “heavy”, “hard” or “soft”, “happy” or “sad” and so on. 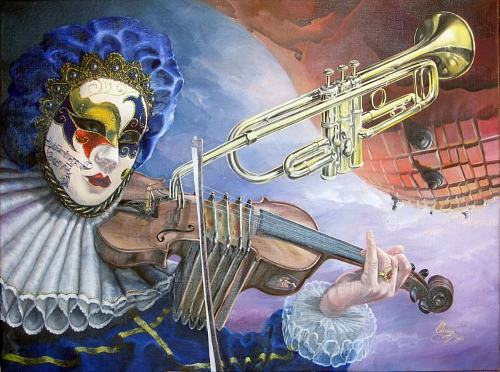 We can invent sceneries fitting the music but they would never completely correspond to the musical meaning. In fact, they would drastically simplify the content. Still, the iconic character of the musical signs lets us fix at least a part of the musical story and cover its most important features; it allows us to make an “abstraction” of the chain of events. If we accept the idea of music telling us a story, adorned, embellished and intensified, we will have to ask ourselves about the characters in these stories and the ways they are able to act. 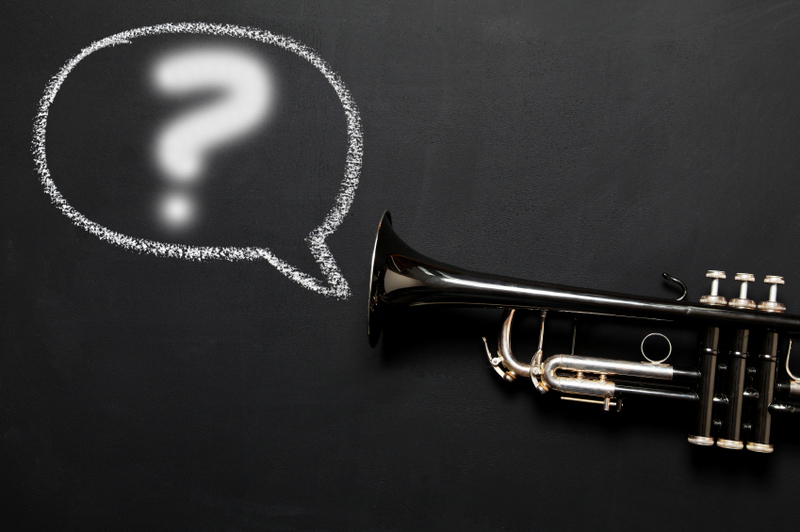 The answer is quite simple – these characters or “heroes” are the musical figures, the smallest units of meaning in music. Often they are called motifs, just as in literature or painting! To avoid confusion, we are going to use the word motif only for figures with a clearly melodic content. We can describe musical events in terms of figures that are exposed, combined and involved in the stories told us through music. For larger musical forms such as symphonies or sonatas a complex interaction of motifs is very typical, the so-called motif work. We call this kind of processing symphonism. Musical figures can be very specific references but also very unclear, impenetrable, amorphous formations, not easily attributable to their originals. From onomatopoeia such as birdsong and water rippling, over fate knocking, signals and cross symbols, to complex abstract figurations – everything is possible, everything is accessible on the composer’s pallet, waiting to be used at the right place and time. It lies in the hands of the music creator, what story to tell, what adventures his figures are going to experience. Will it be a musical poem in which, as it is usual in poetry, only one event is told, shown as many angles as possible, ambiguous and versatile? Or will it be a novel with many motifs fighting and meditating, dancing and melting together? The most important and widespread forge of the musical content is a song. In use for millennia, it is also one of the most typical forms of musical poetry. In most cases it is dominated by one characteristical motive – the “hero” of the song, which is repeated over and over again with different but compatible lyrics. The tight connection to spoken word allows creation of new meaningful references between the word and the pure sound. Whether it is a cradle song, a hymn, a love confession or a dance song, our perception of meanings and semantical references is practiced over and over again, enabling new forms of musical expression. Especially the art song (“Lied” in German) is predisposed to be more than a content forge. Sometimes the music runs in a parallel line to the lyrics, commenting and enriching or even contradicting it, provided, the used musical figures are familiar and understandable to us from the past experience or can be deduced and interpreted from the situation. There is a big variety of musical figures, much more than words in a language. It is not always a melodic structure, it can also be a single chord, a certain rhythm or even a particularly placed or especially expressive tone, as for example a unison in the end of a piece with otherwise rather complex harmonies. It depends on the ensemble of motifs, on the distribution of their functions in the composition through space and time. The more complex the composition, the more figures may appear. Eventually, they would form real hierarchies with main and accompanying figures, leitmotifs and symbols. A detailed description of the musical figures is beyond the scope of this blog. In any case it is important to stay aware that musical figures are in a constant flux and many of them are forgotten and no longer perceived as such. We have to admit that when we hear for example a baroque opera, a renaissance musique de table, or a classical violin concerto, quite a big part of the musical story escapes our understanding. Thanks to a certain continuity of the expressive means within the musical culture, we are still able to enjoy older compositions, often without actually understanding them in the same way they were meant by the author. What we do, is projecting new meaning into it, which we get used to during our education based on the romantic musical language. Its code is multiplied in the uncountable movies and made to a kind of standard, “understandable” to everybody. In the 19th Century Richard Wagner made in his operas a unique attempt to duplicate the whole text of the libretto in its musical counterpart with the help of a complex system of the so-called leitmotifs – small musical figures denoting everything from a sword, person or fire, up to abstract concepts like duty or love. As the result, the musical content of his operas appears to be much more complex than the literary part. This attempt made history and influenced crucially the music afterwards. Composers like Gustav Mahler were much inspired by the musical language of Wagner as they didn’t have to resort to a spoken word any more in order to tell their musical stories. Wagner facilitated and in some sense standardized the musical palette. The following generations could tell us whole symphonic novels using and expanding the newly forged connections between the music and the word. In these works the figures would act and meditate, love and fight, play and dance, ascend and die. The ease and naturalness of our understanding of the musical language can give us the impression of music speaking directly to our emotions but it would be a very superficial view! In reality, we are able to let the complex musical contents into us just because of the long (mostly) unconscious period of the ear and mind training and yes, you can say “conditioning” throughout the time in the cradle and in kindergarten, in the church and in school, even in the cinema or in the disco, actually constantly, even listening to the radio in the kitchen. A really new development came in the 20th Century with the emergence of movies. Now it is no longer predominantly the spoken word helping to forge new musical contents but also the moving images. When movie events are accompanied by music, it allows creating new stable relations, new meaningful combinations of sounds. Very often movie music is based on the classical tradition and is even performed by a symphony orchestra. A good and quite well known example of a new content would be the so-called horror movie music with “screaming” high strings or a chase scene with typical patterns of low piano sounds. The range of expression is only bounded by the imagination and creativity of the composer! Once the musical figures are selected and put into an outline of a story, the next stage of musical design allows us to perceive the figures as embedded into the musical space and time. Different viewing angles are possible; changes of a distance, depth or clarity make the experience even more vivid. In literature or painting these exciting expressive means are called perspective. We are going to talk about it in the next blog. 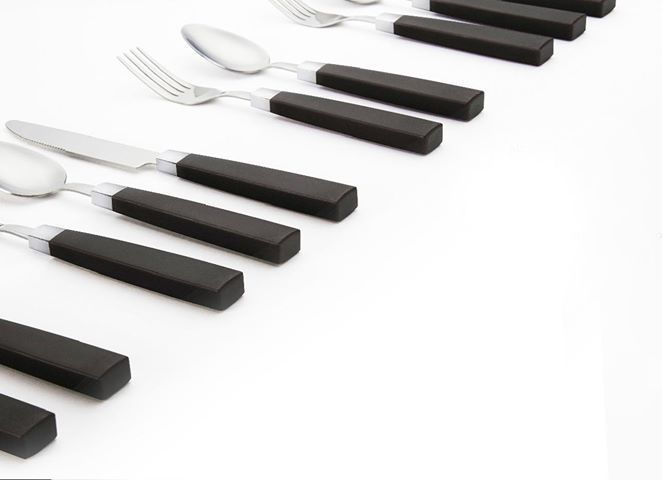 Today we embark on the search for traces of a very fruitful connection enriching both the mind and the stomach: music at the table. There is enough evidence that already in Sumer and ancient Egyptian music was played not only during religious ceremonies, but occasionally during the meal. We can also find many representations from the ancient Greece, Rome, and Israel testifying to the splendor and pomp of ancient royal dinners, where scantily clad artists gracefully represented their musical skills. There is, however, very little information about the sound of antique music. Still, some musical formations are successfully working on the revival of the “spirit and flesh” of that time and bring to sound again what once seemed lost. One of them is “Musica romana” from Cologne. In the late middle Ages, with the further differentiation of the society in Western Europe and the emergence of professional guilds, even more complex forms of the tradition arise. During this time, the composing of music develops into a real profession and composers start looking for new ways to make money. The so-called “Tafelmusik” ​​or “Musique de table” turns out to be quite a lucrative business because writing for a feast was often rewarded much better than in the church or in even an opera house! For example, the delicious “Musique de Table” by Händel not only made him very famous but also wealthy, which was not particularly surprising given the price of the published score: a single set of parts of the composition was sold for eight “taller”, the sum that Johann Sebastian Bach was paid at most for an entire orchestral performance! The scores of Händel’s “Musique de Table” were sold to rich music lovers over 200 times all over Europe. In return, the names of all the buyers (in a special kind of subscription) stood on the score of the first edition. From about the beginning of the 17th Century the Tafelmusik becomes one of the most important musical genres, in addition to church music, opera and dance suite. One of the first known examples of Tafelmusik of the time is “Banchetto Musicale” by Johann Schein (1617) but virtually all the prominent composers of the time contributed to the genre: Avenarius, Hammerschmidt, von Beaver, Ehrhard, Delalande, Lully, Telemann, Vivaldi and others. In 1619, the German composer and music theorist Praetorius describes in his famous work “Syntagma Musicum” for the first time some theoretical foundations of Tafelmusik. Mostly, all the pieces were written in the same key and designed in the form of a suite like following: overture, quartet, concerto, trio, solo (a kind of cadenza) and finale. Usually the music had many quotes from famous contemporary compositions. Actually, to quote the music of other composers was not considered plagiarism at the time; often it was even considered an honor! In the already mentioned “Musique de Table” by Händel there are at least 13 known citations! In the 18th Century, compositions for larger ensembles like concerto and symphony displace Tafelmusik on big stages. The former Tafelmusik finds a new life under the new name of “Harmoniemusik”, literally, “harmony-music”, which reflects its cast – it is written exclusively for wind ensembles which were called Harmonie. These ensembles can be found everywhere and in all layers of the society: at the court, in an aristocratic house, in the tavern round the corner. Their repertoire consists of specially written original works but also of all kinds of potpourri from popular operas or other compositions. Mostly it is a quartet of two oboes and two bassoons, or a sextet of two oboes, two bassoons, and two horns. Often the oboes are replaced by a pairs of clarinets. For many musicians composing Harmoniemusik means a serious source of income, Mozart and Beethoven are among them. Already in his young days in Bonn, Beethoven writes his Octet in E-flat major as a commission of Cologne’s Archbishop Maximilian Franz. It was a great success and an important step in Beethovens composing career. 20 years later this work served as the model for Schubert’s famous Octet. At the turn of the 18th and 19th Centuries composers also start to write compositions where the culinary moment is mentioned but the music is no more intended as background for dining. A good example would be the cantata by Johann Sebastian Bach „Schweigt stille, plaudert nicht“, better known as “Coffee Cantata” telling about an addiction to coffee. Mozart wrote for his opera “Don Giovanni” a very famous “Tafelmusik”, which initiates the final feast of Don Giovanni. From Schubert we know the “Trout Quintet” where he uses his famous song “Die Forele” (The Trout) as a theme for variations. In the 19th Century, with the emergence of the cult of the “genius”, the connection between culinary and musical is seen as too unromantical. It is a time in which the “fleshly lusts” give more and more place to the concept of “eternal love”. What once was Tafelmusik oder Harmoniemusik is now euphemistically called “Divertimento”. The famous gourmet Giacomo Rossini creates something very special. 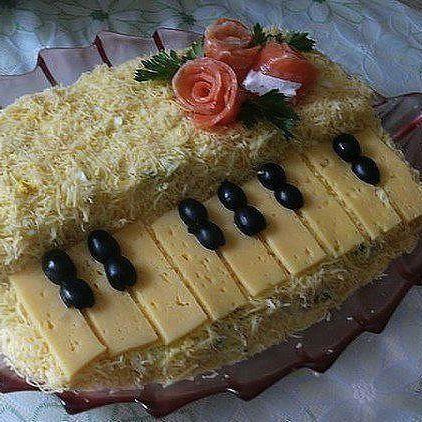 In his last years, he writes piano pieces entitled “Ad antipasti e dessert” with some witty titles about foods. These pieces were not intended for publication but recently they were rediscovered, edited and recorded by a pianist from Cologne, Stefan Irmer. Richard Wagner in his “Der Ring des Nibelungen” describes musically how Siegfried’s mind changes under the influence of the magic potion, which is handed to him by Gutrune. It is a very special episode because here the effect of the drink is implemented with purely musical means! In the twentieth century the original tradition of Tafelmusik is resumed by several composers of the neoclassical school. In 1932 Paul Hindemith wrote his wonderful nostalgical “Tafelmusik” for a chamber orchestra but also the “Hamburgische Tafelmusik” ​​by Gerhard Maasz and “Eine kleine Tafelmusik” ​​by Jeno Takacs find much resonance and are warmly received by the audience. The Cologne-based composer Bernd Alois Zimmermann writes a sarcastical ballet “Musique pour le Soupers du Roi Ubu”. Two Russian composers have discovered a new interesting access to the topic: both Prokofiev in his opera “Love of Three Oranges” and Khachaturyan in the ballet “Cipollino” make fruits and vegetables to actors participating in the action. However, the Culinary itself plays here just a minor role. Our story about the connection between the culinary and the musical wouldn’t be complete without mentioning my own music that is why I would like to present it as well. First, I would like to mention my suite “King Arthur’s Table Music“, a concerto grosso for flute, oboe, clarinet, bassoon, horn, trumpet and string orchestra. The choice of wind instruments as soloists evokes the tradition of Harmoniemusik. What is unusual here, it is the role of the string orchestra which is mostly accompanying and creating the background atmosphere of the piece. Many motifs make allusions to the Baroque tradition of Tafelmusik, thus reviving its unmistakable flair. My piano suite “Amuse-bouches” continues the tradition of the Baroque suite, which itself was also strongly influenced by the Tafelmusik. There are many stylistic allusions to the music from that period but also to the classic-romantical tradition. The main title could be translated from French as “snacks”. 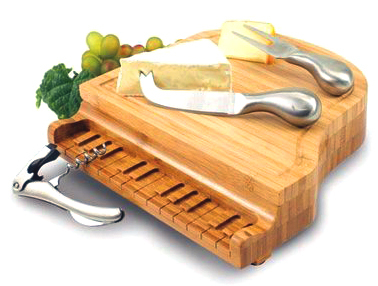 The single titles of “Amuse-bouches” sound like “Allegro con brie”, “Coq-au-vin à la rococo”, “Chopin-gnons sautés”, “Pâté-tic”, “Spaghetti polonaise” or ” Pointillis-mousse”. Since the allusions in the titles are not of purely culinary origin, real “eatable” equivalents would not be possible. They rather try to stimulate the imagination and give some inspiration to the listener. One very special feature of this suite is the extremely short duration of the pieces – each piece only takes one minute. 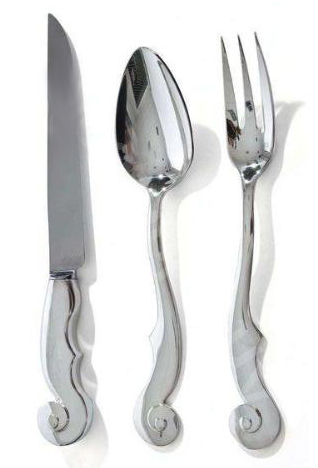 Here you can recognize the influence of the avant-garde French cuisine, widely known as nouvelle cuisine. The brevity of the pieces of the suite symbolizes the very short though intense moment of pleasure that we experience enjoying delicious appetizers. 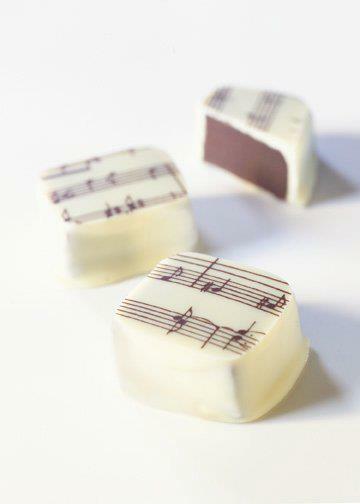 The suite “Petit-fours” for violin and piano is dedicated to sweets. The title is of a French origin and means a “small oven” where small confectionery or savoury appetizers were made next to the main oven. Sometimes “Petit-fours” were also made in the main brick oven during the cooling process. 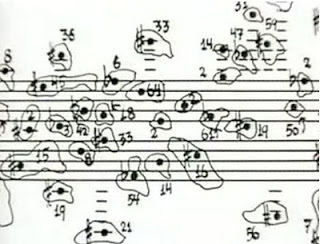 The single titles of the suite sound like “Le sacre du sucre”, “Contrepoint de vanille”, “Mordants en caramel” or “Soufflé virtuoso à la Paganini”. There are 25 of them, also in versions for flute or flute alto. You can find a detailed description of the pieces and their titles as well as a virtual audio on my homepage. „Eine kleine Naschmusik“ (“A little nosh music”) for violin and piano, is another “sweet” composition, an effectfull and very virtuoso homage to Mozart. You can also find a virtual audio of this piece on my homepage. Finally, I would like to mention my piano piece “Hors d’hoeuvre d’un faune” (“The appetizers of a Faun”) from “Suite royale”. It is a homage to Debussy’s “L’après midi d’un faune”. The piece has a subtitle: “in four flavors”. In the recent times more and more concert promoters try to create new opportunities to present traditional classical music. One of them is having a fine dinner accompanied by a small ensemble or at least a soloist in the background. Often they invite barock music ensembles, sometimes even playing original instruments. It remains to be seen whether this trend continues. One of the major challenges is that the audience of these dinners is not willing to spend more than 60-70 € for the event and both a good kitchen and good live musicians cost some money. It is only profitable for the organizer in a big set with many invited guests. Still, there seems to be a big public interest so we can look optimistically at the future of this wonderful tradition. P.S. Special thanks to Maria Dolnycky for critical corrections! Is there such thing as “modern classics”? On such occasions, it is rare to hear someone speak of Shostakovich, Khachaturian, Messiaen, Pärt, Schnittke, Kancheli, or Glass, although they are very often performed and their music always encounters crowded concert halls. It is a very strange situation, and in this blog, I will try to shed some light on the matter. When a new novel by Murakami, Rushdie, Pelevin or Eco is announced, the readers are looking forward to read it and they quickly find the book in the next bookstore, good visible near some thrillers, detective or love stories and other bestsellers. They actually do become bestsellers themselves! On the contrary, in a music recordings store we experience at once a total predominance of pop, rock, hip-hop and dance music, maybe some jazz and world music, presenting most new recordings on CDs and DVDs, but when we take a look at the classics department, what we spot are the names of star instrumentalists and conductors performing music from the past. Why? Two seemingly unrelated questions, on closer inspection they turn out to have a clear connection, and I hope to unveil it for you as well as its reason. To this end, please allow me to make a somewhat seditious statement. Despite the tight inner relation the musical genre called “avant-garde” (or, as we call it in Germany, “Neue Musik”), it is not a hereditary continuation of classical music, but rather, a new branch on the tree of musical tradition, just like jazz, ethno, salsa or tango – also complex and aesthetically beautiful but independent genres that do share much expressive means with classics. Motets of Machaut, sonatas by Couperin, symphonies by Shostakovich or ballets by Stravinsky have indeed much more in common, for example, “Pierrot lunaire” by Schoenberg, written almost in the same year than Stravinsky’s most famous masterpiece “The Rite of Spring.” Of course, there are some or even many similarities between the musical language of the latter two in form, rhythm and colors, but aren’t there also many between, say, tunas and dolphins? Still, they follow very different paths of evolution, and one is fish while the other mammals – a different paradigm of life forms. The same is with music: external likeness can be deceiving! In order to better understand the situation, let me invite you to take a closer look at the most constitutive aspect of music, one that distinguishes music from other forms of art – the relationships of pitches (“Tonhöhen” in German), commonly called “harmony” or “harmonic relations” by musicians. If complex rhythms, colors, semantics, dynamics or articulations can be found in other kinds of art – painting, film, poetry, sculpture, etc., only the relationships of pitches are exclusive to music and in their complexity not translatable to other arts. For a better understanding, it must be mentioned that pitches shouldn’t be mixed with the notions of altitude and height in architecture, which have rather a symbolical meaning and belong to semantics. If we observe the development of music harmony through time, we quickly recognize that the avant-garde really represents a new model, a new paradigm of musical art, as jazz, for example, did in its time. I am going to show you the difference using the language of symmetry, as it seems to me the easiest one to follow for the non-musicians among you. There are two main types of symmetry governing the structure of any work of art. The first of them is the golden ratio, a proportion between two parts where the smaller one relates to the bigger as does the bigger to the whole (to the sum of both parts). In a very rough approximation this relation is 1:2 (more precisely 1:1,618). The golden ratio belongs to the larger notion of “dynamic symmetry,” to which the Fibonacci sequence also applies. 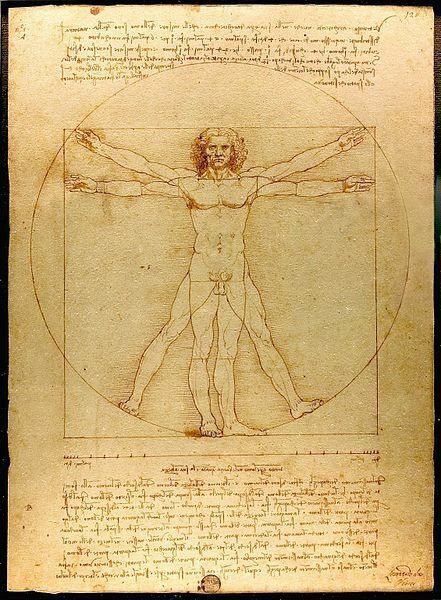 It is omnipresent as well in nature as in the arts, and human body shape is vertically based upon it – the navel relating to the whole body, or the knee relating to the whole leg, are points of the golden ratio. As the parts in the golden ratio are not equal, it promotes hierarchical functional relations between sounds and chords. The second principle is a simple repetition, or in a more generalized form, a periodicity. It can be reflective or rotational, and it prevails in an inanimate matter, such as crystals, for example. That is why it is also called “static symmetry.” Nevertheless, it is widely present in nature, and if we take the human body, the periodicity governs its shape horizontally, i.e. it mirrors from one side to the other. The periodicity promotes flat or egalitarian relations, where the elements are not unique but mostly exchangeable. Now let us take a closer look at music harmony. As far as I can tell, ALL western musical tradition is built on the harmony of the golden symmetry. With some certainty, it applies to the whole Indo-European tradition going back to several millennia! Concretely, it can be recognized at the preference of relations that can be traced back to the overtone sequence, one of the main notions in acoustic studies. Every musical tone has a fundamental frequency and many so-called overtones or partials which are higher frequencies resulting from the vibrations of smaller parts of the string or the air mass in a wind or brass instrument. An example of such a ratio can be a subdivision of a string into two, three, four, five, six, etc. equal parts by pressing the string at exactly that point, after what the shorter part of the string would sound, respectively, an octave, a fifth, a quarter, a major third, a minor third, etc. higher from each other. The same happens when the air mass in a wind instrument tube (such as a flute) becomes shorter after the division through a hole – in the middle, at a distance of one third, one fourth, one fifth, one sixth, etc. These divisions also sound, respectively, an octave, a fifth, a fourth, a major third, a minor third etc. higher from each other. From a historical point of view, the development of music harmony (especially in polyphony, the multi-voice tradition) is constantly moving towards more complexity of relations and, at the last stage, to even distorting or layering of more simple structures. Good examples thereof would be the music of Stravinsky, Prokofiev, Britten, Hindemith, Messiaen, or Schnittke. Still, the basic harmonic principle can always be traced back to the symmetry of the golden ratio. During the millennia, we are so used to listening to music based on the symmetry of the golden ratio, that even in the case of the so-called “free atonality,” we are still trying, unsuccessfully, to recognize at least some remnants of the classical tradition. The reason why we don’t succeed in recognizing them lies in the fact that the new tradition created a completely new model of pitch relations substituting the symmetry of the golden ratio with periodicity. 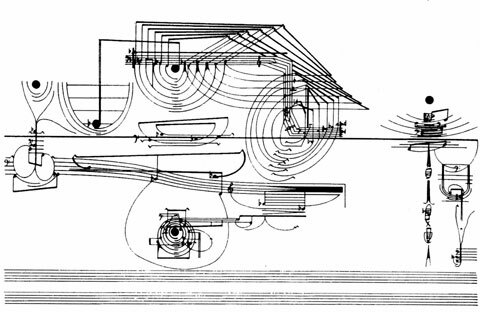 The foundation of harmony in avant-garde music is the division of the octave into 12 equal parts: the pitches are organized in such a way that no tone or chord can predominate over the other sounds. The best way to achieve this is to favor intervals of a major seventh and minor second, thus emphasizing the smallest division of the octave into 12 equal parts. The second choice is the tritone and minor third (or a minor sixth) as an indication of the division of the octave into, respectively, two and four equal parts. The most typical chord is the mix of these intervals and, where earlier parallel octaves ran, there are now parallel major sevenths. Clusters and pointillistic structures are also very suitable in establishing the periodicity in the harmony and the independence of the 12 tones. There is also a subdivision of the octave into three equal parts building the so-called augmented triad, or into six equal parts building the so-called whole tone scale. Both were extensively used in the beginning of the 20th century, also in the classical tradition as an element of estrangement. Still, for the build-up of thirds, typical in the classical tradition, these scales and chords could be easily integrated into the context based on the golden symmetry. In avant-garde music, the ambiguity of the augmented triad and the whole tone scale were frowned upon and generally avoided. By the way, in the music of other traditions, for example in the Indonesian “slendro” or “pélog” scales, other divisions of the octave are used. Thus, the “slendro” scale is a strict division of an octave into five equal parts, and the “pélog” scale uses seven tones chosen from the strict division of an octave into nine equal parts. Some other divisions have been tried out in electronic music. Speaking of other musical parameters, I would like to point out that the periodical symmetry has always dominated the rhythms but not the note values, which have shown, in particular with the evolution of triplets, quartuplets, quintuplets and so on, a clear affinity with the golden ratio. Musical form is a well-balanced mix of both principles – the small parts of a composition lean towards periodicity, the bigger ones towards the golden section, which is why the climax is normally positioned at the point of the golden ratio. Markings of intensity, or dynamics (such as piano or forte), when measured properly in accordance with the air pressure produced by the sound, match a sequence of octaves, thus leaning towards the golden ratio, but can by no means be compared to pitches or rhythms in their complexity. Avant-garde music has found a new audience and now belongs to an acknowledged part of the musical world, especially as part of festivals dedicated exclusively to this new musical art. 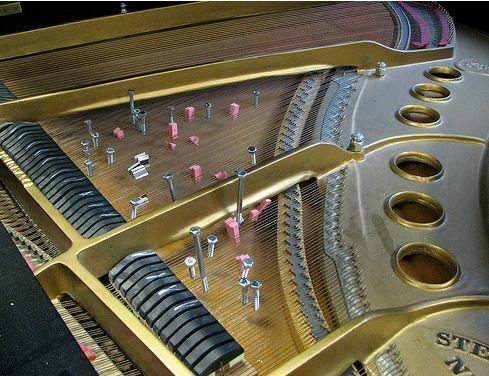 Still, it has difficulties to be accepted by the audience of classical music in a traditional concert environment. The composers of the avant-garde tradition have always claimed to be a logical continuation and even the successor of the classics. 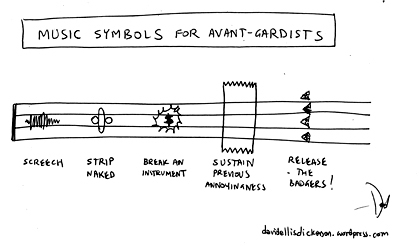 Actually, the term “avant-garde” itself (meaning “fore-guard”) is misleading, as it positions avant-garde as heir to the classics, which shouldn’t be affirmed after careful consideration. Still, as a marketing instrument, it has helped a lot in establishing a new tradition and helping it to survive. The new development confused a big part of the traditionally oriented audience, who started to associate “contemporary” with “avant-garde,” very often ignoring or “forgetting” that all the other extremely successful composers whom they listen to with pleasure, like Shostakovich or Khachaturian, Pärt or Glass, are also MODERN but consequently continue the classical tradition. People tend not to associate them with the terms “contemporary” or “modern,” and they are more known just for their names. As a result, one part of the audience, hungry for new experiences but unable to accept the avant-garde approach, turned to other genres of music, such as jazz or rock. Another part of it discovered historically older layers of music, especially Baroque music and even earlier music, performed on original instruments. The more conservative part of the audience started to develop a constantly growing interest in new interpretations of known works. Some elements of the avant-garde have found their place in music of the classical tradition, such as in the music of Schnittke or late Stravinsky. I myself also quote it sometimes, but it remains an element of estrangement, like Chinese music by Borodin, jazz by Stravinsky, gamelan by Debussy, or birdsong by Messiaen. In all these cases, the “strange” style has a symbolical meaning and is not the proper foundation of harmony. Returning to the original question about whether there is such thing as modern classical music, I definitely can say yes!